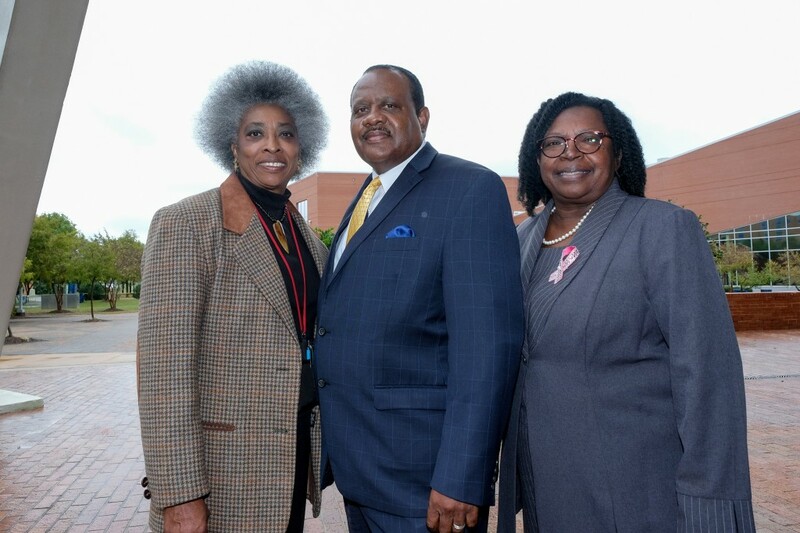 Dr. Glenda Windfield, director for the Deep South Synergy Teachers of Visually Impaired Project (left); Dr. Daniel Watkins, dean of the College of Education and Human Development, (center); and Dr. Locord Wilson, associate dean of the College of Education and Human Development. Deep South is funded by a grant the university received in 2016, where Windfield served as principal investigator. The modification is a byproduct of that grant and was initially designed as an add-on endorsement for teachers working with visually impaired children. The grant was then adjusted to offer a master’s degree at the behest of the Office of Special Education Programs. Students roughly need 39 credit hours to complete the program. Except for core requirements, 27 credit hours are strictly focused on the study of visual impairments with no deviation or electives. “Visual impairments is a low incidents area as it relates to special education, but it’s so specialized that you need people who really know how to work with these types of children to help them compensate for any types of deficiencies in learning because of their sensory deficit,” she said. The director called the modification necessary as it would help to facilitate the dire shortage of teachers equipped to work with children with visual impairments. Dean of the College of Education and Human Development, Daniel Watkins expressed that all people deserved the opportunity for holistic education. “Many times we forget the underserved or those who need special attention,” he said. “We must never forget that we as educators and those who prepare educators seek to reach all students. Watkins also commended Windfield on her efforts. Although the director has an extensive career working for and with the blind, she considers her foray into the field a matter of happenstance. After graduating with a degree in music education from JSU, Windfield shared that she had no desire to teach. Instead, the former Sonic Boom of the South saxophone player wanted to be a band director, which was considered taboo in the 70s. However, when the Mississippi School for the Blind was in need of a band teacher, Windfield applied and received the job. She conveyed that despite people tending to underestimate individuals with disabilities, they are fully capable of learning. Windfield expressed that many of the children she taught during her 15-year tenure were brilliant. Windfeild later transitioned to Vocational Rehabilitation for the Blind where she spent three years. She said both jobs gave her firsthand knowledge of the educational and professional obstacles faced by the visually impaired. Now, Windfield is at JSU continuing her advocacy. “Dr. Windfield has the potential with this grant to populate our state with some qualified educators for the visually impaired students,” said Dr. Locord Wilson, associate dean of the College of Education and Human Development. “This is an awesome responsibility for her as the director of this project, and she is more than capable and qualified to lead this charge successfully. Wilson then goes on to describe Windfield using a line from a speech orated by Helen Keller, the first deaf-blind person to earn a bachelor of arts degree.